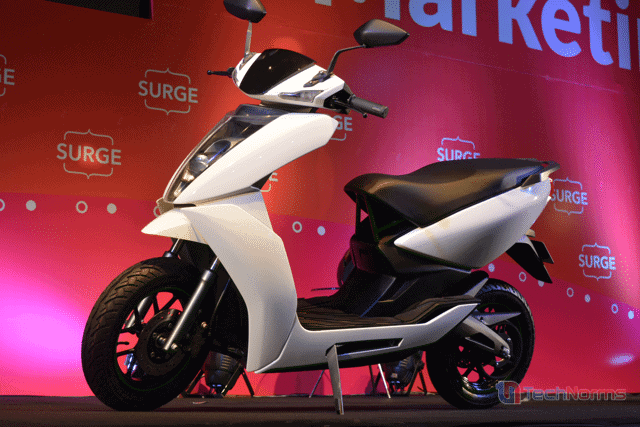 Ather Energy unveiled an electric scooter, the Ather S340, at Surge Conference today. It is slated to be India’s first smart electric scooter with a Linux-based touchscreen dashboard with 24/7 connectivity, user profile based sign in, on-board navigation, pre-configured drive modes and an integrated mobile app that makes it a wholesome and convenient solution on the go. The S340 was built from the ground up, with most parts designed in-house by the team at Ather Energy. The vehicle will be manufactured in Banglore and will be available in Banglore, Chennai, and Pune when it launches. Pre-orders will open next quarter. The Ather S340 is a forward-looking vehicle that breaks the mold of the two-wheeler industry today and adopts tech for tomorrow by going electric and making it smart right from the design phase. The S340 comes in with built-in diagnostics to detect and display issues. “The future will be connected and inevitably electric, and we are proud to unveil the Ather S340, a manifestation of this philosophy. The possibilities of connected vehicles are endless, and the S340 is our first step towards this future. 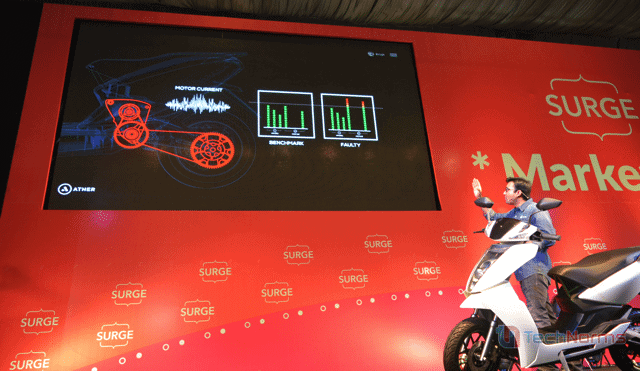 SURGE was a great platform to unveil a technology-driven product, and after almost three years of design and development, we are very excited to share our creation”, says Tarun Mehta, CEO, Ather Energy. Electric: uses a waterproof Lithium Ion Battery. Range: up to 60 km. Linux-based touchscreen dashboard that can be connected 24/7 and is easily viewable in bright sunlight. User profiles that can be used to sign in. Pre-configured drive modes: Sport and Economy. OTA (Over The Air) updates to the vehicle’s software. Customized recommendations based on predictive analytics and aggregation of ride statistics. You can get a 360-degree look at S340 here. The pricing of the S340 is not yet known. The pricing will be announced shortly before it is available for pre-order next quarter. The electric scooter is going to be launched in 3 cities – Pune, Banglore, and Chennai. 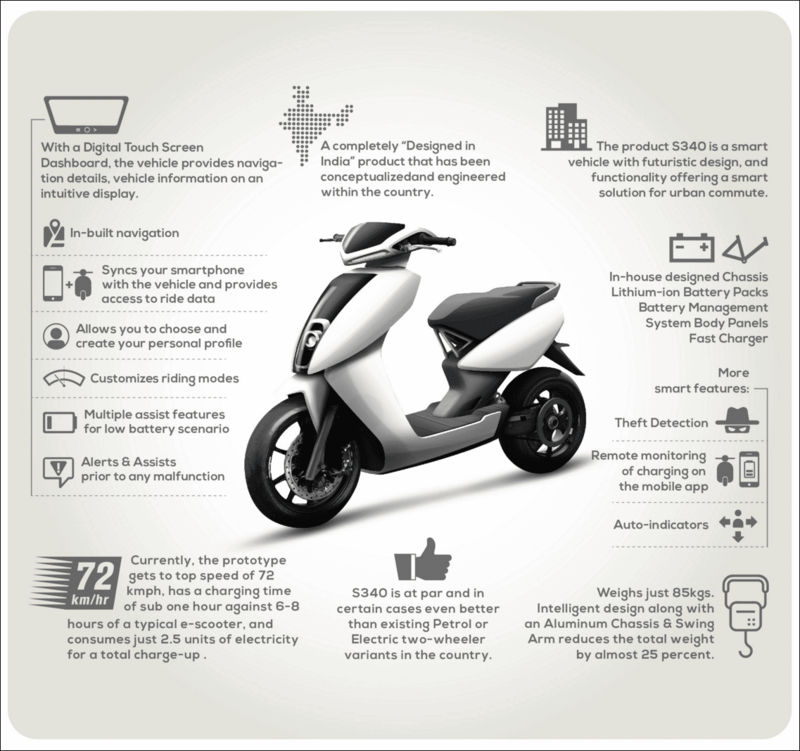 Ather Energy has clear intention not to do things the way traditional two-wheeler industry does. The brand will build an online-only purchase model, and the vehicles will be delivered to your doorstep. They plan to establish ‘experience centers’ for prospective customers to test-drive the S340. Going a step (or perhaps a few miles) beyond the established industry players regarding Support and Service, a charging point will be installed at your home when the S340 is delivered. Also, in case you have any problem and need maintenance, that is also going to be provided at your doorstep. Production of the Ather S340 is expected to start by the end of 2016.